Partial set of Tony Gwynn 2001 Upper Deck Retirement baseball cards including cards 1, 2 and 3 and the unnumbered header card, missing cards 4 and 5. 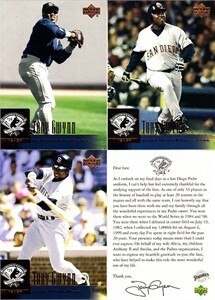 These cards were randomly distributed exclusively at one 2001 San Diego Padres home game. About NrMt-Mt condition. ONLY ONE PARTIAL SET AVAILABLE FOR SALE.